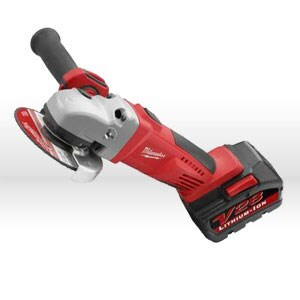 With a 28-volt motor and M28 Lithium-ion battery, the 0725-20 delivers the speed (8,000 RPM) and power needed for fast grinding and cutting applications with longer run time. The overload protection and soft start features extend tool life.Large spindle lock and slide on switch. Kit includes: Spanner wrench, 4-/12" X.045"X7/8", 1 metal cut-off wheel,4-1/2" X 1/4"X7/8" type 27 metal grinding wheel, one V28 Li-Ion battery pack, V18-V28 Li-Ion charger & contractor bag.